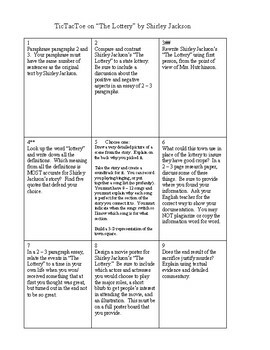 After reading Shirley Jackson's story, "The Lottery", students will choose three activities to complete. The top right square has the mark ##. This is the Gifted and Talented square. GT students are told ahead of time that they must pick a three-in-a-row pattern that includes that square. In the second row, there is a square that has the mark **. This is the Special Education square. SpEd students are told ahead of time that their pattern of three-in-a-row must include that square. These activities could be done as a learning center, homework, or during whole class time.